If you are looking for my CR84FN post, please scroll down or click here.. thank you! Happy Sunday! I hope you're all having a great weekend.. Sabrina and I spent yesterday making some Valentine treats for her teachers, therapists and para aides. Last Christmas, I got a great idea on Amy Sheffer's blog and tucked it away for Valentine's Day. In her post here, she made some Comet White Chocolate Crunch and packaged it up as Christmas gifts. This yummy snack is so easy to make! 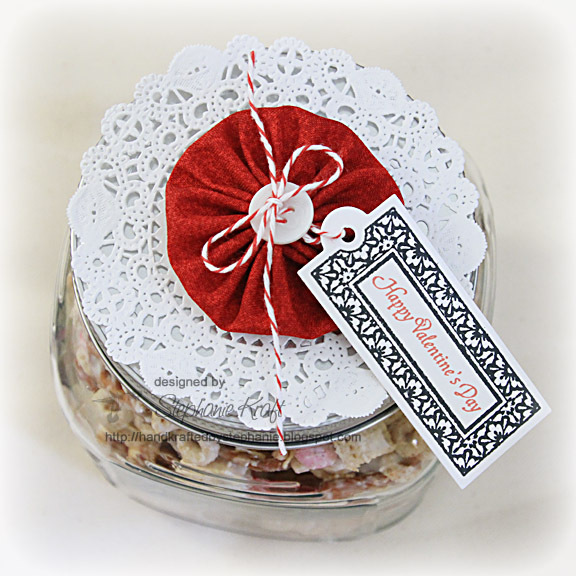 I took her suggestion and made Cupid's White Chocolate Crunch (for Valentine's Day) and packaged them up in the same cracker jars that she used. They make for great packaging and are affordable at $3 per jar (found at both Target and Wal-Mart). I used a doily as my base. Then I added a handmade yo-yo that I made out of some red marble fabric. I added a button and tied on a tag with some Divine Twine. To make my tag, I first started by stamping one of the tags from JustRite CL-02080 Fancy Tags Set - Cling. 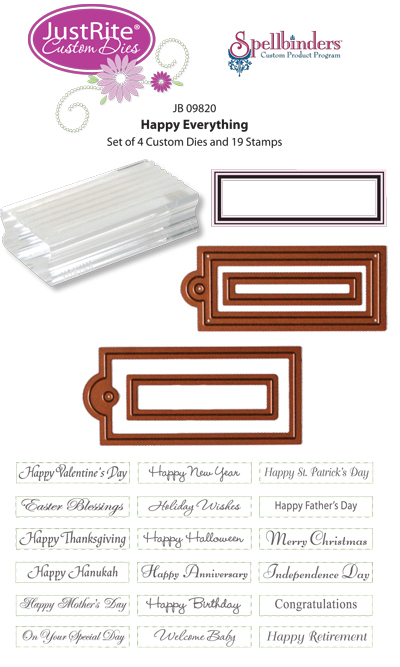 I then cut and embossed using a custom die from JB-09820 Happy Everything Mini Tag Kit - Interlocking (dies are co-branded with Spellbinders). 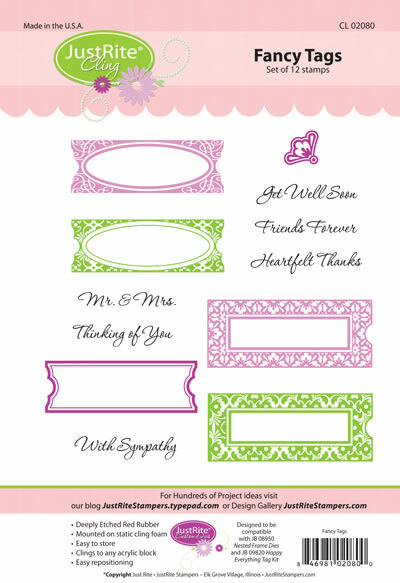 My sentiment is also from Happy Everything, which is full of sentiments that you can use all year long! Mix the first five ingredients in a very large bowl (this makes a LOT). Melt the chips and oil in the microwave or in a double-boiler, and pour over the cereal mixture. Stir well and spread onto wax paper. When cool, break into chunks. I have 14 more jars to decorate, so that's all for me for today! I hope you have a Happy Valentine's Day! Accessories: JB-09820 Happy Everything Mini Tag Kit - Interlocking, Button, Divine Twine, Doily, Fabric, Handmade yo-yo. What scrumptious Valentine treats Stephanie! 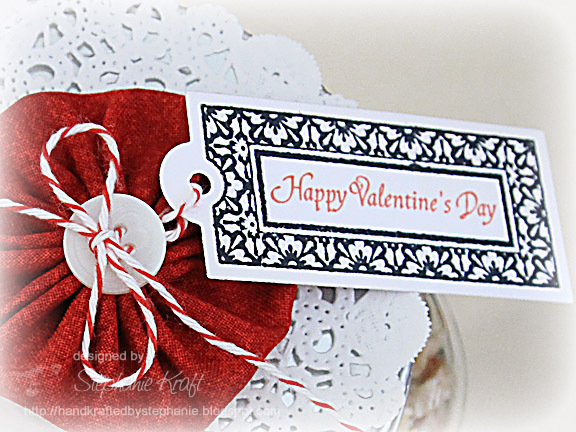 Love the little tag and pretty fabric embellishment! 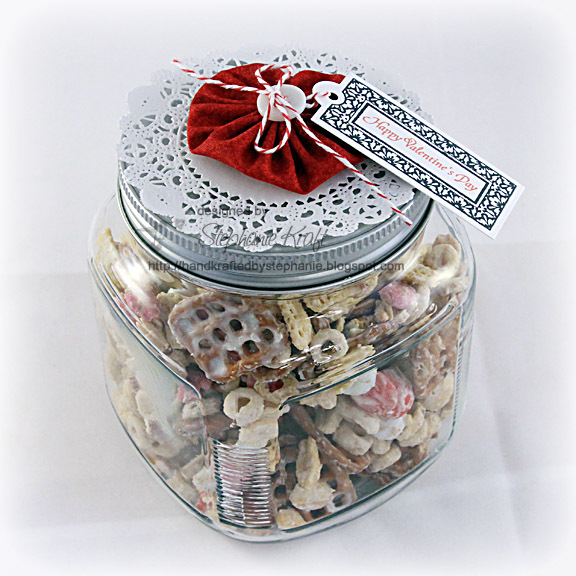 What a great jar and filled with such DELICIOUS looking treats!!! Love The awesome yo yo!!! These are lovely and sound so yummy! I may have to try making some! Yummy! Delicious snack mix and love the toppers!